Thanks Paul. I've got a D11 and J11 (both from Union Mills) that are (very) slowly undergoing the Dr Al treatment. One thing I have learnt about this is that it is far far easier to drill the holes to clearance on a resin print than it is to drill them from scratch on a metal model! The biggest piece of advice I can give on 3D printers is anything below around £2k is not worth getting at the moment! Best place to start is to learn one of the free CAD programmes and get a third party bureau to print them for you initially - although if, like me, you like to go through several design iterations/phases, it can get very expensive to go down that route! Ok, the tender print is done and fits the frames! That's the good news... The bad news is that I've designed the flared top too thin so if you so much as breathe on it, it disintegrates! I've done a bit of redesigning to strengthen the flare without compromising the look of the model and a new print is on the go. Fingers crossed that it'll be strong enough to withstand handling this time! In the meantime, following some interesting conversations with another modeller on this site, I thought I'd find the various bits and pieces from a long shelved project to do a bit of investigation on. Above is an old Farish J69 bodyshell. The original chassis has long since given up the ghost and, as you can see, many years ago I had a stab at modifying a Union Mills tender drive to fit underneath it. The tender drive/chassis isn't much to look at and with my home brewed pickups fitted, it ran like a dog. However, I think that there may be some merit in this approach so I might see about getting things running. I think that the key thing is that I can loose what's left of the drive chain that is no longer driven. I'm also going to lose the motor mount as, it interfered with the badly made homebrewed coupling rods (thankfully lost in the mists of time!). This will mean that the Union Mills motor will no longer be attached to anything but I don't think this matters as I'm looking into potentially using one of Nigel Lawtons mini motors (or maybe one of the 716 motors that briefly became available on ebay last year and seem to be the same type that power the newest Farish models). Wheels: I'm not happy with my Union Mills driving wheel bodge so I may well have a go at trying to fit these ones off a scrapped Fleischmann locomotive. I did briefly toy with the idea of trying to drill out the Fleischmann block to take a gear train as it would save me from the problem of coupling rods. However, the coupled wheelbase is a bit too short to properly represent a J69. Another option could be to use the Dapol Ivatt or Prairie tank chassis, gears and coupling rods with a new motor as, while a little too long, the plastic chassis might be easier to adapt. However, I'm aware that the running qualities of these locomotives has been described as a bit variable. As you can tell, I'm far from decided as to how I'm going to tackle this. What does everyone else think? Don't expect quick results with this, it's just something to pass the time with in between other bits and pieces. You are a braver man Than I am Steve! - I will watch this with interest, as I have a couple of these and have long wanted to find an alternative chassis. Thanks Alex, don't hold your breathe on this one though! Ok, the first piece of renewed investigation into this is to find some drawings. I have a copy of the Roche scale drawings (dated Sep 1948!) 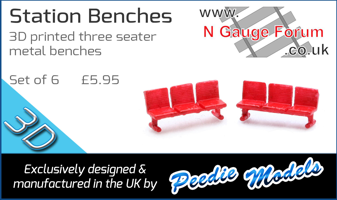 which I've scaled down to N gauge and offered the body to these. Hopefully, the first thing that you will think is that the old Farish body is too long - and you'll be right! Dead scale would put the locomotive at just a smidge under 50.4mm in length over the buffer beams. However the Farish body comes out at 53.75mm or 1.06 times bigger. Factor in that the tanks are too high and the boiler is somewhat over fed and you'll quickly come to the conclusion that this is not a scale model! That's not to say that I am criticising Farish's efforts, far from it. This model dates way back to the beginnings of Farish's N gauge adventures in the 1960s (was this the first locomotive released?) and I think that it represents an incredible achievement to squeeze a working chassis into such a tiny space! In addition, while not up to modern standards, the detailing is quite nice than the designer/tool maker made a great effort to capture as much as they did. Those of you who have studied the bit of the drawing visible can see that the wheelbase should be 6'4 by 7'6 (or 13'10 - 28.5mm in N gauge), just a smidge over an LNER standard tender which is 6'3 by 7'3 (13'6 - 27.81mm). However if I scale the overall wheelbase by 1.06 to match the body it now comes out at 30.21mm. 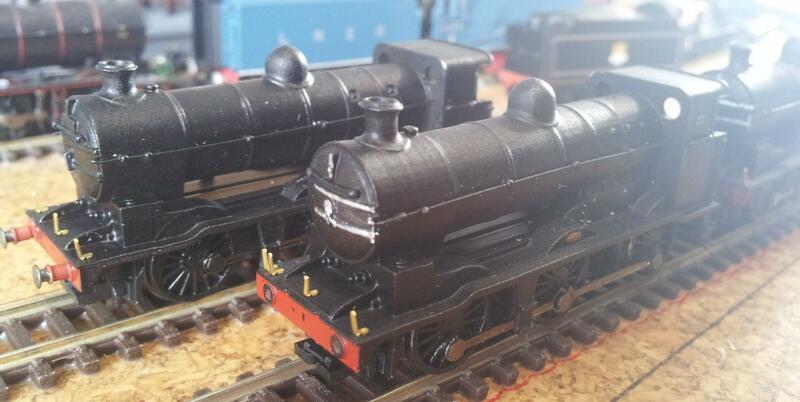 The Dapol Ivatt and 45xx chassis both have a coupled wheelbase of 7' by 7'9 (14'9 total - 30.38mm in N gauge) so it would appear that the Ivatt or 45xx chassis would be a close match in overall wheelbase (and around 0.3-0.4mm out around the centre axle) while keeping to the stretched proportions of the Farish J69 body. Hopefully you've been able to follow my reasoning here. Ok, one more post from me (I'm sure you're all getting bore of these updates now!). So, while waiting for yet another D49 tender body to finish printing, I've been messing around with a little more detailing on one of the J6s. It has now gained an etched coupling hook (2mm association product) and a vac pipe. The vacuum pipe I'm quite proud of as it is simply a piece of 18 gauge guitar wire with some of the winding stripped off and fitting to a handrail knob to represent the fixing bracket. I'm sure that this is far from an original idea but I think for the first time I'm starting to get a feel for how these models will look when finished. The vac pipe isn't permanently attached yet as I'll paint it before final fitting. Edit: It seems rather quiet around here today... Anyone seen that Paul Price person? Some great detailing work on their thread, very inspiration! Thanks Jonas! I've just posted on your own thread about your exception work on those 37s! Looking at the photo of the J6, I keep thinking that the vacuum pipe looks a bit overscale. However, it's been measured up and made on top of a set of scaled down drawings so it must be right. What does everyone else think of it? Moving back to the D49s: I've finally cracked the tender! It now fits over the Dapol donor frames/motor and the flare is now strong enough to resist handling! I think the vacuum pipe will look great when painted an almost black colour. The bare metal will be reflecting the light and making it look bigger! I'd give it a lick of paint before deciding I think. The 3D prints look amazing! Thank Jonas, the prints are starting to scrub up well are they? The pipe has been painted black and I've picked out the flexible hose section in a dark brown. Once dry I'll refit it to the model and see how it looks. Following the somewhat unsuccessful attempt to utilize a Union Mills tender drive under a more of less scale tender and with the help and advice of a fellow forum member, I've finally gotten around to redesigning the J6's tender to fit the Farish J39 drive. Slightly stretched but not looking anywhere near as out of proportion as I'd first feared. Not all is fitting quite right and I expect to go through another couple of prints before I'm 100% with the fit. This does mean that the J6's will hopefully be a straight swap for the J39 bodies (accepting that the lubricator drive will have to be removed from the J39 chassis). Lamp brackets have been painted as has the vac pipe which isn't glued into place yet - does the pipe look overscale? I think that Jonas was right that painting has given it a better sense of proportion (it is actually to scale!). Lovely job there Steve, it really looks the part and on the track most will not even notice the slight stretch. That there is no chassis surgery necessary is really handy. Presumably J39 tender chassis weight reused so doubling up as a means to fix the chassis on the tender using existing screws? Also, assuming the DCC socket has been removed to keep to the lower tender profile is there still room for hardwiring a small DCC chip if needed? The only chassis surgery necessary is the removal of the lubricator drive on the locomotive and, ideally, the bracket that supports it from the chassis. So far I'm working out the fit issues surrounding reusing the Farish tender weight but the front end and the DCC chip is proving to be a little more of a problem. The tender drive in picture has been stripped of its DCC chip but I'm sure that I can find the compromise that allows everything to fit while retaining the character of the prototype. Not much else to report really. Being a bank holiday weekend, I really thought I should spend at least a bit of it with my better half. That said I've managed to find some to start painting up some buffers, chemically blacken some etched coupling hooks (I really should have done that on the first one I fitted! 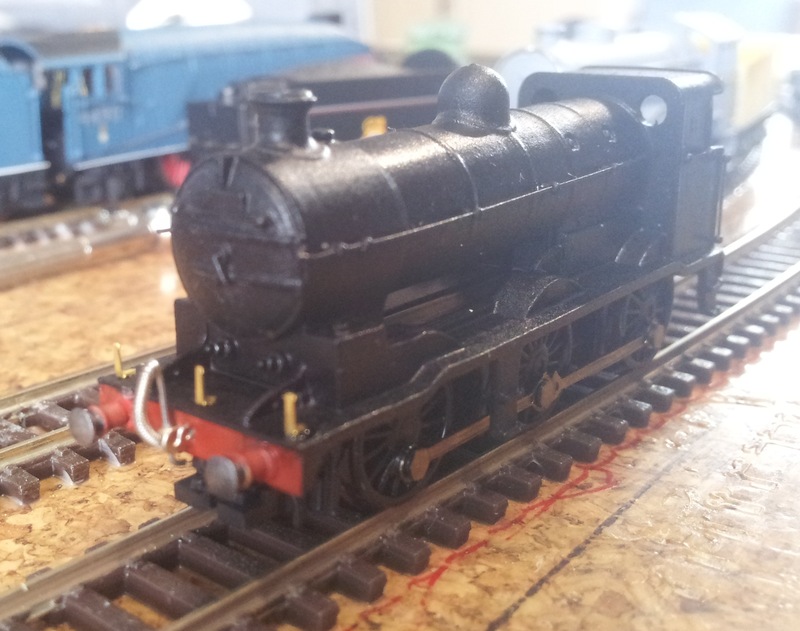 ), rub down one of the D49 tenders and made up a few more vacuum pipes! Speaking of vacuum pipes, on the first one I managed to force fit the handrail knob to the thicker wire - this worked but I almost destroyed the handrail knob in the process! On the next couple I've made up, I drilled the hole in the knob out to 0.4mm which proved to be surprisingly easy. The homemade vacuum pipes now fit easily onto the knob and overall it takes less time to drill out the hole than to try and force fit it. Good to learn you are trying to reuse the existing weight. A hard wired decoder won't need a lot of space, by way of just one example, the Lenz Silver Mini is only L 10.6 x W 7.5 x H 2.6mm!